car2go parking is available at WallyPark, next to the Seattle-Tacoma International Airport. In addition to your trip cost, it’s just $5.00 for any trips to and from AirPark. From there, you can use the free shuttle to get to and from the terminal. It costs just an additional $5 (plus tax) for trips to and from WallyPark. 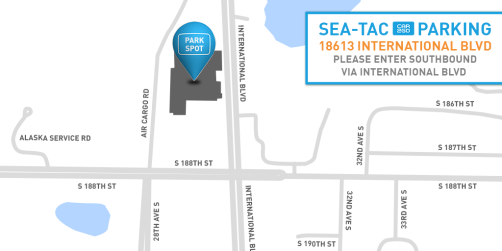 Enter the lot at 18613 International Blvd, SeaTac, WA, 98188. Proceed to the gate and take the ticket from the machine. Please leave this ticket on the dashboard of the car as the next member will need it to get out of the lot. Enter the parking lot and turn left- the car2go spots are located on the entrance level at the end of the row. End your trip in one of the designated car2go stalls. The stalls are designed to fit two car2gos, so pull forward to allow room for a second car2go to park behind you. If the spaces are full, you can park in any unreserved space on the entrance level. The WallyPark 24/7 shuttle will pick you up in front of the WallyPark Lounge located on the entrance level just steps away from the car2go parking stalls. The shuttle leaves as soon as it has passengers and will get you to the airport in approximately 5 minutes depending on traffic. The cost of the shuttle is included in your drop off/pick up fee. Bon voyage! Locate a car2go after you’ve exited the plane via the car2go app. If you reserve your car, you'll have 30 minutes to get to the vehicle. Exit baggage claim and proceed to the “Buses, Shuttles, and Courtesy Vehicles” area located on the third floor of the Sea-Tac parking garage at Islands 1 and 3. Take the Wally Park shuttle that reads “Premier Garage or Garage” on the LED sign (the others don't drop at car2go spots). This shuttle runs every 5 minutes during peak travel time, or call 206-455-9611 to request a shuttle. Once you board, let the driver know that you're picking up a car2go. The shuttle will drop you off at the WallyPark Lounge area just steps away from the car2go parking stalls. You can now return to the Home Area and end your trip at your final destination. Welcome home!